A hot pink colour scheme laced its way through the wedding of James Forshaw and Stacey Sumner. They met as teenagers when James was working for Stacey’s dad and she sent him a text message whilst in a music lesson at school. The proposal came on Christmas Day 2013 when James had organised a present hunt throughout the house for their children. At the final location there was a present wrapped for Stacey which was a packet f Haribo sweets with just hearts and rings included. When she opened the present, James got down on one knee and asked her to marry him. As well as hot pink, navy blue was a theme for the day too with the bridesmaids wearing navy backless dresses and the flower girls in elaborate puffy hot pink dresses. The men followed through with navy suits and hot pink ties and Stacey, 28, wore hot pink shoes under her white dress. James, 32, general manager of a manufacturing company said: “The room was set out all hot pink too. Everything and everyone looked great. 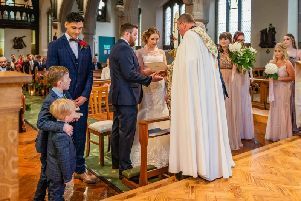 “Adam the photographer definitely went above and beyond to capture some extra special memories that I don’t think he could of if the weather wasn’t the best day of the year to date. He even lied on the grass and in the muddy borders just to get that perfect shot! I would do it all again, I have married my best friend after all! Care worker Stacey added: “The whole day was just perfect! A girl dreams of a fairy tail wedding and I got mine... I loved being a princess for the day in the most amazing dress! “Now I know why people would love to do it all over again even after the stress of planning it all. It was all worth it. They honeymooned in York and Benidorm.